MC Pusha T (pictured here -- post-apocalypse -- in a really nice suit) is releasing a new solo album on Tuesday. 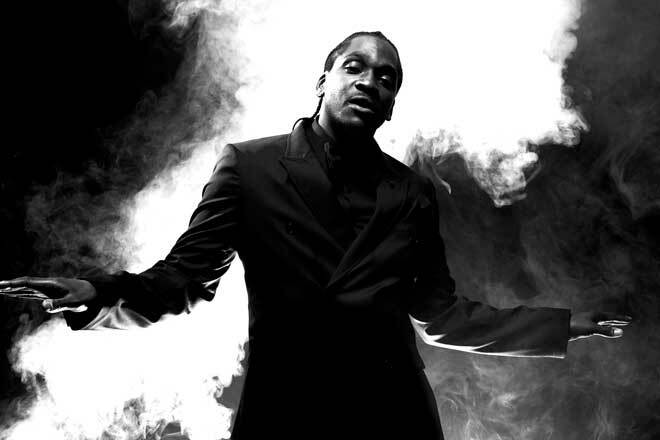 Rapper Pusha T has been a lot of things in his career: Half of the duo the Clipse, a member of the Re-Up Gang, secret weapon of Kanye West. But one thing he hasn’t been is a solo artist. Until now. On Tuesday, Pusha releases Fear of God II: Let Us Pray, an EP that has become the MC’s jump-off as a standalone artist and a statement on where he’s been musically since signing with West’s G.O.O.D. Music label. “I just want people to take this EP — Fear of God II — and just love it musically and listen to the lyrics, just get into my world,” Pusha said in an interview with Wired.com. Collaborating with folks like West and one-time Clipse producers The Neptunes (Pharrell Williams and Chad Hugo), he’s pulled together a solid solo effort that’s especially impressive since it started out as a mixtape he’d planned to release for free. Wired.com: How did the new album come together? Pusha T: This EP started off just as a mixtape project, like those I’ve done in the past. It’s something that I usually give away for free. But at the same time, it’s also the set-off for my solo career. I felt like in doing this I could show my peers and the fans that I am worthy and I can do a solo project after being in a group for this long. I felt like at the same time I could really show that there’s a range to my music lyrically and in musical taste. Wired.com: The new album has quite a few high-profile appearances from artists like Diddy, 50 Cent and Young Jeezy. Pusha T: I felt like it would be a great time to show the alliances that I have in the music industry. And the respect of the people I have in this industry. The Clipse have really been snobs in regards to collaborations. We haven’t really worked with a lot of people, or pursued to collaborate with a lot of people. I think this is a good time to do that. Sometimes fans want to see you with their favorite artist. You may not be their favorite artist but they’ll respect you and want to see you with their favorite artist. Wired.com: Did you feel like you had to call in favors for this kind of solo project? Pusha T: Actually, the album still wasn’t an album when I got those records done. It was still just me doing a mixtape. It was me saying, “I’d love to rap beside 50.” And 50 saying, “I’m down.” Those fell into my lap. The song with Diddy, that fell into my lap. Rick Ross, I asked him to do a record and a week later he sent it back to me. Those people have such a love and a passion for music that it’s not a big deal for them to do music. Wired.com: It seems like you’re always having fun on Twitter. Do you like that platform? Pusha T: I enjoy Twitter a lot. The thing is, I’m really late to Twitter. At one point I wasn’t even running my Twitter. My manager was. And I don’t like his dialog, so I was like, “You’ve got to stop this.” When I got on it, it was such a great way to find out and gauge the response of the public. I honestly think it’s a better gauge than blogging, or blog comments. If I post a record and they immediately listen to it, you’re getting the instant reaction. Wired.com: Yeah, and blogs have a much different vibe. Pusha T: Sometimes when it’s a blog situation, you have people who comment on those things a little differently. They’re competing with the other people who are also commenting. It’s a little bit more calculated on the blogs. Wired.com: Do you do any other social networking? Pusha T: Not really. I do have a Tumblr, but I haven’t really utilized it to its fullest. I really should do it more. If Don C gives me a snakeskin snapback I’ll post that to Tumblr. But that’s about it. Wired.com: You reached out to Tyler, the Creator from Odd Future, who’s also on your album, back before he blew up. What’s it been like watching that crew get so popular? Pusha T: It’s really good. It’s actually really fresh to see Tyler and the whole Odd Future gang…. Their whole energy reminds me of the Star Trak energy when I first started. Honestly. I like to see them get their accolades. They’re getting to do what a lot of people in music don’t get to do — they’re doing what they want to do. You see a lot of people in the music industry, and they’ve conformed a little bit to the protocol of music and putting it out. Like, “I’m going to put out the R&B record, I’m going to put out the hard rap record….” But just to watch this fresh energy, it reminds me of the Star Trak movement. Like when Pharrell and Chad were just going crazy and Pharrell was singing all the hooks on all of the top hits at the time. And then to put out a record with no hook like [the Clipse song] “Grindin.” It’s just that level of freedom and that level of creativity that I admire. I look at them and I know what they’re going through. They can do no wrong. Wired.com: Finally, we have to ask, where did the “uggghck” sound come from? Pusha T: It just came from writing, from writing lines and being disgusted by what you just said. Like the verse is so disgusting.